Our product range includes a wide range of polyimide kapton tapes. Kapton Tapes are made from Kapton film with Silicone adhesive. They have been used in applications at temperatures as low as -269°C (-452°F) and as high as 260°C (500°F). SSC have set the industry standard for over 5 years in high performance, reliability and durability, with a unique combination of electrical, thermal, chemical and mechanical properties that withstand extreme temperature, vibration and other demanding environments. 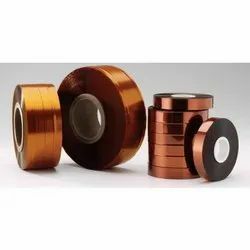 Kapton polyimide Tapes make innovative design solutions possible in a range of industries including, consumer electronics, solar photovoltaic and wind energy, aerospace, automotive and industrial applications. Kapton Tapes have a high dielectric strength.